Around these parts, we're pretty big fans of RKSS, the Canadian directing collaborative of Anouk Whissell, Francois Simard, and Yoann-Karl Whissell. We were big fans of Turbo Kid (review) and were pretty excited when it was announced that the collaborative would be working together again on Summer of '84 and now we've got your first look at the thriller which had its world premiere at Sundace yesterday. 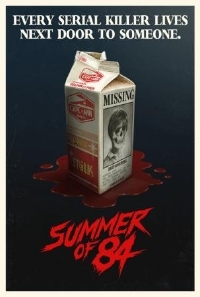 As the title suggests, the movie takes place in the summer of 1984 and stars a group of teens who take it upon themselves to investigate the police officer who lives in the neighborhood and who they believe is a serial killer. Summer of '84 is already garnering praise and comparisons to both "Stranger Things" and It. The trailer certainly suggests that the group have nailed the period trappings but more than that, anyone who's seen Turbo Kid (and if you haven't, what are you waiting for?!) knows that the team also knows to handle storytelling and nostalgia without being saccharin. We expect to be hearing news of a distribution deal in the coming days.